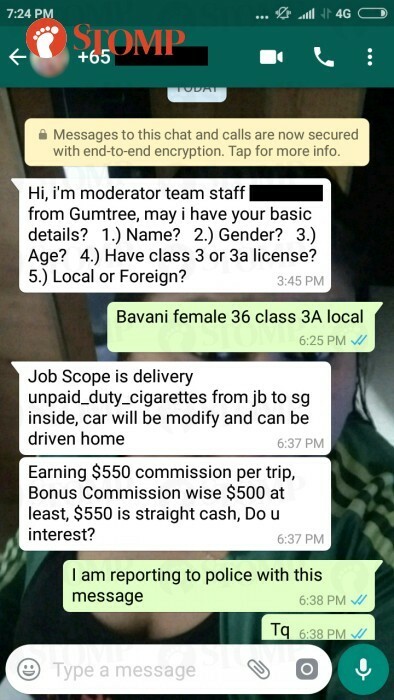 Stomper Vani responded to an online job listing that was looking for drivers -- but was shocked when she found out what the job entailed. She told Stomp that she came across the advertisement on the Gumtree mobile application on Wednesday (Oct 24). Vani said: "I replied with my number and asked for details of the job scope. "Awhile later, I received a WhatsApp message from a new number asking me for details such as my name, age, and driving license details. "I messaged him back and subsequently received a text that made me feel shocked." "This guy openly asked me to smuggle cigarettes from Johor Bahru to Singapore, furthermore saying that a modified car will be given to me to drive home." According to Vani, after she replied that she would be making a police report, the other party did not respond and she blocked his number. She then went to lodge a police report. "I am sharing this so that people will be aware and not get involved in this kind of thing or fall for this kind of job 'opportunity'," said Vani. Responding to a Stomp query, the police confirm that a report was lodged. Check out similar encounters that Stompers had in the related stories below.